“In June 1883 two ships the Furnesia and the Belgravia came into Valentia Harbour and took a human cargo of 1,200 people from the Iveragh Peninsula to America. In 1845 at the start of the Great Famine, over 70,000 fled the country, with more than 50,000 going to the United States. In 1883 termed ‘the year of free emigration’, a total of 105,743 people left the country, almost 83,000 of them destined for the U.S. Much of this exodus was orchestrated by the unjust and pitiless land system where fair rent, fixity of tenure and free sale were non-existent. But it was not until 1882 that there came any worthwhile government aid for emigration. This resulted from the crusading work of one James Hack Tuke, an honourable Quaker from the city of York who was active in charitable work in the West of Ireland. He was appalled by what he described as ‘the culmination of man’s degredation’. The Government of the day was unwilling to undertake the huge expense involved, but Tuke persisted until grants were available to intending emigrants at the rate of 5% per adult. Since the various shipping lines were offering steering passage to America for a little as £4 per adult, Tuke’s scheme became known as ‘Free Emigration. 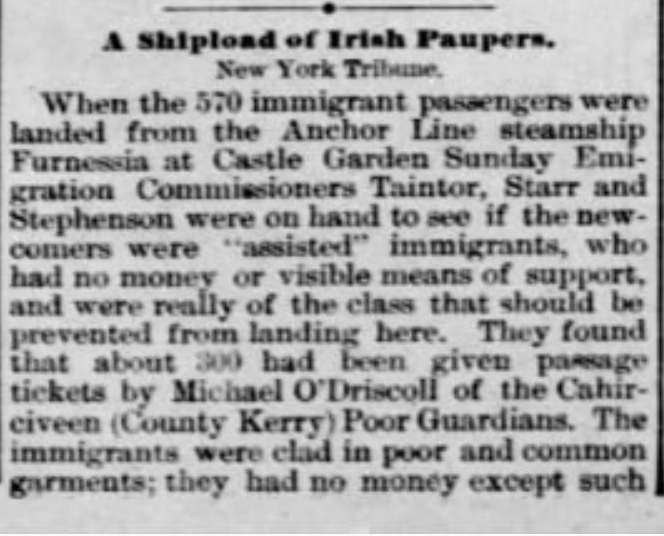 The Cahirciveen guardians had despatched a number of emigrants via Queenstown (Cobh) in April 1883 and availing of Free Emigration, they entered into direct negotiations with the Anchor Line Shipping company for direct transport from Valentia Harbour. The Belgravia was the first ship to sail past the Lighthouse into Valentia Harbour and was reported as being the largest ship to ever enter Valentia Harbour up to that time. Cahirciveen Parish Priest Rev. Canon Brosnan went on board and having gathered about him the emigrants of his own parish, gave them his blessing and farewell. The Belgravia left Valentia Harbour at 4pm on Saturday, June 2, 1883. The final parting was pathetic, touching and grief stricken. 763 embarked, of whom about 471 were adults, 273 children and 19 infants, with about a dozen deciding at the last moment to remain behind. 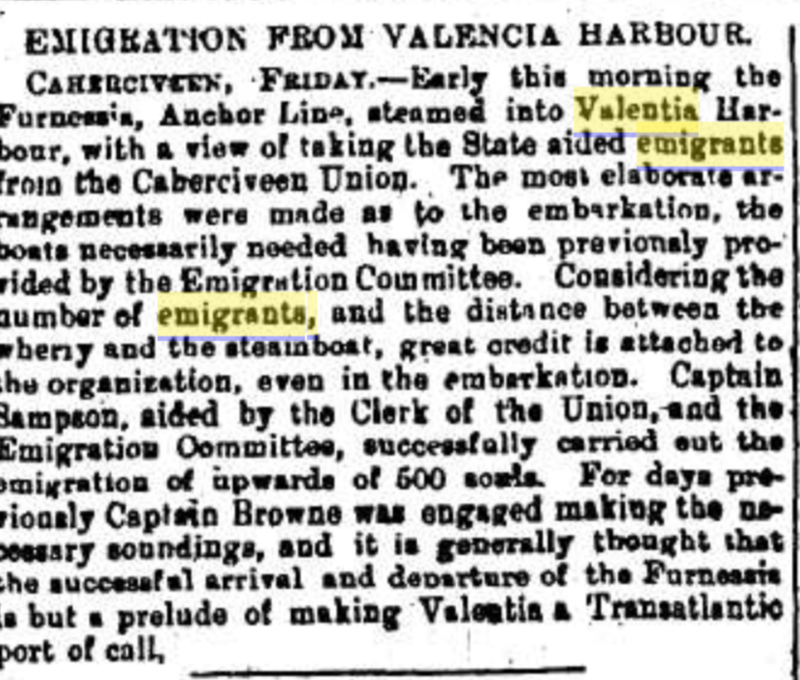 Just two weeks later, the Furnessia, a larger ship of the same line entered Valentia Harbour and transported a further batch of 436 state aided emigrants to America, making a grand total of 1,199 in one fortnight. 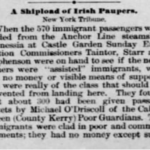 The Kerry Examiner newspaper paid tribute to the exemplary conduct of the relatives and friends of the emigrants, of whom the reporter stated ‘a crowd of more than 5,000 assembled on the shores of Valentia and Renard to bid farewell to their dear ones about to leave for America’. Ten days after the Belgravia’s departure from Valentia a telegram announced the safe arrival of the emigrants in New York. But the Furnessia’s passengers met with a frigid welcome in the United States. Fanned by local newspapers, opposition was growing to what was described as ‘Britain’s exportation of Irish paupers’. The New York Daily News carried the following blanket condemnation: ‘Hundreds of assisted emigrants arrived here on the Furnessia last evening. They contrasted unfavourable with the previous comers. Five heads of families came directly from the Cahirciveen workhouse. All of them were poorly clad, have no money and no friends. Their arrival excites much indignation’. Some were even sent home. Of the 100,000 or more who left Ireland for lands unknown in the year of Free Emigration only a few would ever see their homeland again. All over America, Canada and to a lesser extent Australia they found their last resting place in the cold soil of the stranger. Not for many of them the warm welcome of friends and family on these foreign and unknown shores, but often having to endure vilification and loathing on their arrival. 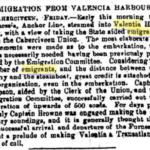 Today, let us remember those Valentia and Iveragh people who set out from Valentia Harbour for America in the Belgravia and Furnessia in what were days of woe and sadness here in the year 1883″. Full list of passengers on Belgravia and on Furnessia. We are indebted to Brother Peter Lynch (of the wellknown Valentia Lynch boat building family) who in the 1980s painstakingly copied down in foolscap sheets ever single passenger and their ages. These were later transcribed (with dates of birth) by Daniel Sullivan, a Dublin born son of Valentia parents whose great grandfather Michael O’Sullivan had been both Registrar for Births/Deaths/Marriages, Valentia & Clerk of the Court of the Petty Sessions on the Island. Wow what an eye opener ! My grandmother Kate Shea and her sisters came over just after this time period. Many people from Valentia Island settled in the New London, Connecticut area. I never realized how many people left Valentia in such a short time, Truly sad times when people have to leave their homeland because of the of poverty that was present along with sickness and political issues. Thank you for the eyeopening. I am so glad I found your blog. This article and the web page links is so wonderful! I hope you never give up. The story of immigration all over the world is a toppic of importance that needs addressing. When I think of what the stong hearty people of Ireland put up with this so long is part of all our legacies. I cannot believe how people can be so ruthlesasly7 cruel to each other! I have found my ancestors in county Kerry and feel I want to know more about the history of the area and it;s people. I did purchase your book and hope I find more about Co. Kerry from your blog. Thank you for being so devoted to County Kerry and Ireland in general. (Found our name Denis Greany in Kilcummin m. 1843 and loving in Kileentierna 1846.) He married Hanora Coffey, daughter of James Coffey and Julia Sullvan. Also found her sister emigrated to Boston and married there in 1851. Where did Denis Greany come from? Thanks and keep up the good work! Love your blog and web site! Patricia, as you say Denis Greaney married Hanora Coffey in Kilcummin in 1843. His address is given as Ardagh – this could be correct or may be a transcription error and it could be that it was Hanora Coffey who was from Ardagh. In either case, there is neither a Greany nor a Coffey named as occupiers of tenancies in Ardagh in Griffiths Valuation 1852. There is one lot (a house) ‘vacant’ so it would look like the Greany family had left Ardagh by 1852.